This is probably the easiest snack and recipe ever, but so much healthier than the alternative of grabbing a bag of fried chips. I’m always trying to get my clients more involved in their food and eating “cleaner,” less processed foods. In general, potato chips are the perfect example of a highly processed food. You start with a whole potato, which is sent to a processing plant where it is inspected then placed on a conveyer belt that moves the potato through the various stages of processing. The potato is peeled and washed then passed through a revolving impaler that then cuts it into chip-thin slices. The slices go into a second wash that removes the starch released when the potatoes are cut, then they are chemically treated to enhance their color and immersed in a solution that has been adjusted for pH, hardness, and mineral content. The slices are hit with air jets to remove excess water as they fall into troughs filled with hot oil for frying. Salt is sprinkled from receptacles positioned above the trough. Back on the conveyer belt, excess oil is drained off and the chips begin to cool. The chips are then passed through a drum filled with the various desired powdered seasonings, then the packaging process starts. I’m not going to go into detail about that, but I think you can see the difference between eating a whole food, a potato, that was simply grown and harvested, and a processed food, a potato chip, where many of the nutrients the original food had are lost in the refinement process. So let’s put this in perspective of our normal every day lives. On one end of the spectrum you have the farmer who grows their own fruits and vegetables, has their own chickens that hatch their own eggs, and raises their own livestock that eats hay from their pasture and drinks the water from their creek. This person knows exactly where all of their food comes from, the components of each food and any processing that their food endures happens in their own kitchen. At the other end of the spectrum is the person who goes through the fast food drive through. They have no idea where their food came from, what kind of processing it went through, or how it was cooked or prepared. The meat in a single fast food burger could come from dozens or even hundreds of cows an I’m not even going to start going through the steps of processing in a fast food burger or we’d be here all day. So if you want to snack on some chips, fine. Just think about where they come from first and remember just how easy it is to just make your own. 1. Preheat oven to 375 degrees F. Spray the bottom of a baking sheet with extra virgin olive oil. 2. Use a mandoline to get your chip slices to your desired thickness. 3. For the BBQ chips, sprinkle with your favorite powdered BBQ seasoning or rub (I used Rathbun Family Barbeque Rub). 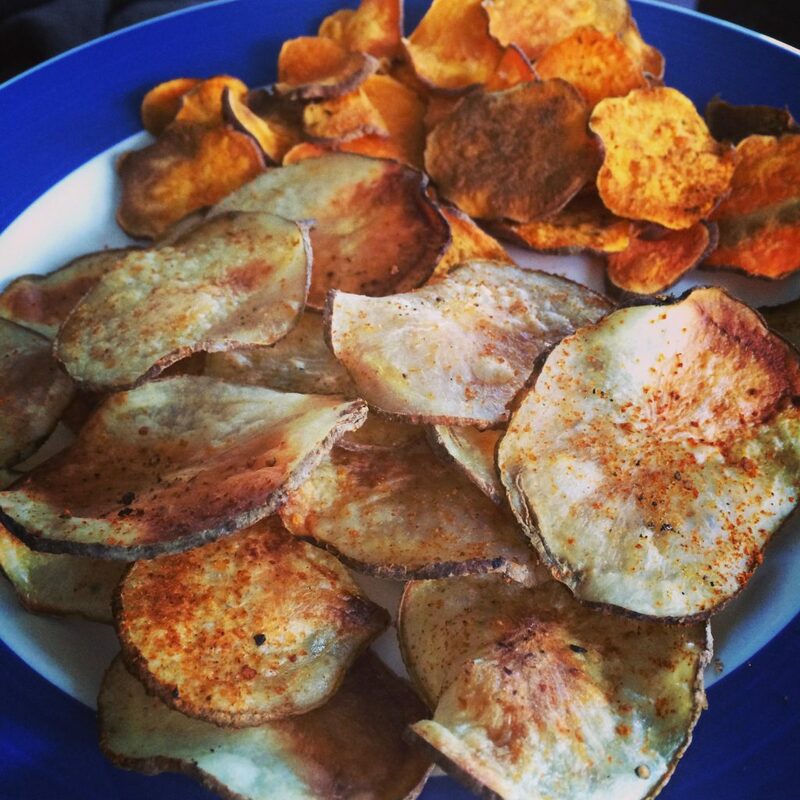 For the curried sweet potato chips, I sprinkled with curry, cumin powder and a little chili powder. 4. Bake for 10-15 minutes then remove from oven, flip each chip and sprinkle the other side with desired seasonings. Continue to bake until desired crispness, about another 10-15 minutes.